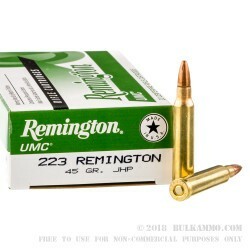 A simple, light load for the .223 Remington round that excels for small game, varmint and intermediate game hunting where applicable by law. 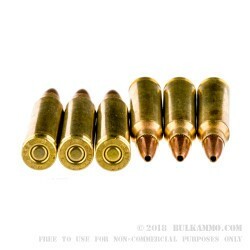 This load features a lead core projectile with a .45 grain total weight in a jacketed hollow point bullet profile. This light grain weight can push a few additional feet per second on the velocity scale and works very well at the higher twist rates for those who are shooting out of the AR platform. This will function very well out of a 1 in 9 inch barrel a 1 in 10 inch barrel and even longer rates of twist between full turn. 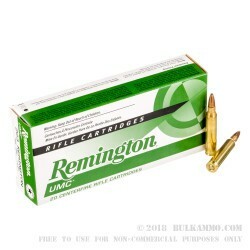 This Remington UMC load is a budget line for the brand and offers a good price point for a dedicated hunting round. Note: some jurisdictions in the U.S. require a minimum grain weight, an all copper bullet or a certain caliber to be able to hunt certain game sizes or species. 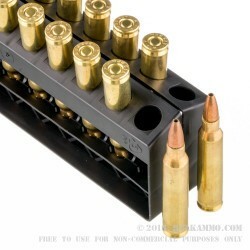 You should check your local and state laws before hunting with this cartridge, though it is generally safe for use on Varmint. This will perform for such a use case on varmint out to about 225-275 yards generally.